IT staff and computer repair shop technicians are always having to perform recovery tasks on their client’s hard drives. Whether it’s imaging or data recovery, you probably need to connect the drive to an enclosure. 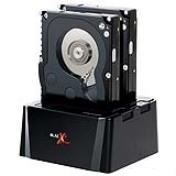 Many enclosures get the job done, but may not be friendly for quickly hot swapping drives, often times requiring unscrewing screws to release the drive. What do you do if you want to image to a new drive? You would either need a second enclosure for the new drive or create a local copy and then use the original enclosure. This takes too much time and effort. IT staff has more important things to do than fumble with unfriendly enclosures. There are servers to manage and tech review sites to read. Thermaltake helps make computer support easier with their new iteration in the BlacX line. We present the the Thermaltake BlacX Duet Docking Station. controller for two hard disk drives to be seen at the same time. All USB supports Port Multiplier function.